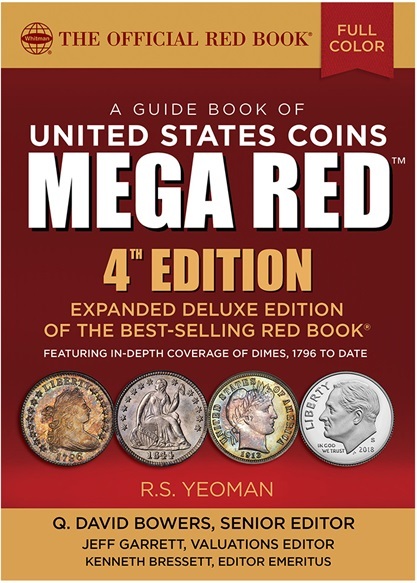 (Pelham, Alabama) — The fourth edition of MEGA RED (the Deluxe Edition of the Guide Book of United States Coins, also known as the Red Book) will officially debut April 10, 2018, with retail pre-orders being shipped on that date. The 1,504-page MEGA RED retails for $49.95. It can be pre-ordered online (including at Whitman.com) and after April 10 will be available from booksellers and hobby shops nationwide. Every U.S. coinage series has been updated and revised in the fourth edition, and new sections have been added. The book includes an extensive 294-page feature on America’s ten-cent coins (Draped Bust, Capped Bust, Liberty Seated, Barber, Mercury, and Roosevelt dimes), written by Q. David Bowers and covering 845 varieties from 1796 to date. New appendices explore error and misstruck dimes; pattern dimes; counterstruck dimes; dime scrip issued by banks, merchants, and towns; “paper dimes” from the Treasury Department; Civil War sutlers’ “dime” tokens; Civil War ten-cent store cards and dimes used as planchets for silver Civil War tokens; dimes discovered in the SS Central America; the history of the famous 1894-S dime; a snapshot of the dime market in 1946; irradiated dimes; an illustrated essay on the greatest U.S. dimes; the “Liberty” subset of First Spouse gold coins; and more. Billed as the “biggest, most useful Red Book ever,” MEGA RED measures 7 x 10 inches and has 1,040 more pages than the regular edition. The larger size and increased page count combined make MEGA RED five times bigger than the regular-edition Red Book. It prices more than 8,000 items in up to 13 grades each, with 48,000 individual values and more than 15,000 auction records covering circulated, Mint State, and Proof coinage. The book is illustrated with thousands of full-color images, including thousands that are new to this edition. MEGA RED covers American coinage from New England colonial times to the modern day—half cents through $20 gold double eagles, plus bullion, commemoratives, Proof and Mint sets, error coins, significant tokens and medals, coins struck by the United States for the Philippines (1903–1945), and other numismatic collectibles. It follows the basic structure of the regular-edition Red Book, but each chapter is dramatically expanded with more historical information, more die varieties, detailed grading instructions with enlarged full-color illustrations, specialized advice on strike characteristics and other technical details, market analysis, auction data, and guidance on collecting and investing in rare coins. Kenneth Bressett, who has served as MEGA RED’s Senior Editor since the first edition, has retired this year to the position of Editor Emeritus. Stepping into the Senior Editor role is former Research Editor Q. David Bowers, with Jeff Garrett continuing as Valuations Editor. A 57-page introduction, “The Story of American Money,” is based on the work of the late Dr. Richard Doty, senior curator of the National Numismatic Collection at the Smithsonian. Dozens of numismatists have contributed research, photographs, market analysis, and other valuable knowledge and resources. Each year’s new MEGA RED features an in-depth focus on one or more coin series. The first edition included a 364-page section on copper half cents and large cents, with images, history, diagnostics, and pricing for 832 die varieties, 1793–1857. The second edition featured 330 pages covering 607 varieties of Flying Eagle, Indian Head, and Lincoln cents, 1856 to date. The third edition’s feature was on nickel five-cent pieces—Shield nickels, Liberty Head nickels, Buffalo nickels, and Jefferson nickels—covering 545 varieties in 314 pages. For federal coins, detailed charts show each mintage; a summary of certified population data; average national retail prices in grades ranging from About Good to high Mint State and Proof; and three or more recent auction records for most coins. Enlarged close-ups of die varieties provide visual guidance. Extensive chart notes give the backstories and additional details on significant coins. Regularly updated appendices include illustrated essays on misstrikes and error coins; rare and collectible numismatic books; bullion values of common-date silver and gold coins; the top 250 coin prices realized at auction; grading standards for U.S. coins; special modern gold coins; So-Called Dollars; coin clubs; and modern United States Mint medals. The book’s special-feature appendices include fresh material with each new edition. Past editions have explored coin cleaning, preservation, and conservation; counterfeit coins in today’s marketplace; the dynamics of the rare-coin market; techniques of smart bidding at auction; Scouting and numismatics; American Arts gold medallions; investing in modern gold and silver bullion; building a registry set; determining coin prices and values; predicting the rare-coin market; how to get a new die variety listed in the Red Book; collecting numismatic literature; hobo nickels; love tokens; and chopmarked coins. MEGA RED will be available from booksellers and hobby shops nationwide, and online (including at www.Whitman.com). Whitman Publishing is the Official Supplier of the ANA, and Association members receive a 10% discount off all purchases.